Airing Tuesdays 9pm on the Nine Network. Rated M.
On Tuesday night, the Nine Network screened the first two episodes of mini-series The Bible (brought to you by The Lone Ranger, apparently). As the second episode began, #TheBibleAU was trending on Twitter at #1 in Australia. That’s pretty cool! The promos run in the weeks beforehand claimed more than 100 million viewers had seen this series worldwide, and that it we could expect it to be ‘bloodier than Game of Thrones’. Obviously the secular audience loves a bit of violence. And, as promised, The Bible delivers. Although, it also manages to convey a really clear emphasis on God’s promises to Israel. Squeezing the books of Genesis and Exodus into an hour each is no easy feat. But the producers do it surprisingly well by focusing on the key players – Abraham and Moses. The first episode, Beginnings, began with Noah. That’s right. Amidst the flood, Noah fills us in about the first six chapters of Genesis – creation, the fall, Cain and Abel. It feels to me like the fall is brushed over way too quickly, especially for such a major event. But Noah links it all together for us, explaining that the flood was to ‘cleanse the earth’, and that God will now make a new beginning to restore the relationship between him and humanity. We are then raced through history until the time of Lot where the producers slam on the brakes. This is where the much-anticipated violence gets underway! Relational conflict gets plenty of airtime too. We experience Sarah’s anguish. We witness the uncomfortable awkwardness with Hagar and Ishmael. And the episode finishes with Abraham readying to sacrifice Isaac – until God’s surprising whispering voice halts him. Cramming all of this into an hour is crazy. And lots gets left out (We don’t meet Jacob or Esau, Joseph or Pharaoh). But the producers are clearly trying to be intentional about focusing on God’s promises and Abraham’s faith. Exodus begins with Moses – not as a baby but as an Egyptian. Once again, we’re flying through the chapters! But it makes sense dramatically. We meet Moses as the person who he thinks he is. And we discover along with him his true identity as an Israelite. This makes for a stark contrast between palace-dwelling Egyptian and whipped Israelite slave. The plagues begin (montage!) and the passover strikes Egypt, by way of swirling white mist. Moses then helpfully and verbally reminds us of God’s promises to Abraham as the Israelites walk out of Egypt. Just as in Beginnings with Abraham, this is an episode about Moses and his faith. Despite the doubters, he leads the people as he trusts God’s promises. The Red Sea swallows up the enemy. And as the episode concludes we very briefly see the Ten Commandments given on Mount Sinai. So what do we make of these first two episodes? Yes, creative license has been taken. Yes, there’s clunky dialogue and odd accents (a Scottish Noah – really?). But this is just the start of a ten episode series. And we’ve been shown it’s all about God’s promises to his people. Why would God choose someone like Abram to be the father of a nation? As we saw, Abraham had real trust in God. As did Moses, in these great promises. I’ll be interested to see how the series handles the fulfilment of these promises as it unfolds. 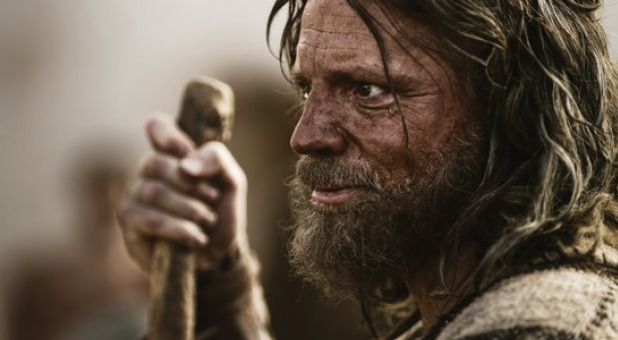 To see the Bible – in dramatised form – screened in primetime is incredible. Yes, people might be watching for the violence, or to have a laugh, but this is a great opportunity to have chats with your mates about the Bible. Why not make plans for next Tuesday night? Get your mates around with some cheap Tuesday pizzas and watch the next instalment featuring Joshua and Samson! It’s easy stuff to watch together. And could be a great opportunity to get discussing as to where God’s promises to Abraham are leading. Posted in TV ShowsTagged christian, Exodus, Genesis, review, The Bible, The Bible TV Series, TV Review, TV ShowsBookmark the permalink.